For today’s card, I used the Lures and Fishing Line images. I stamped the lures image on watercolor paper, and painted it with waterbased brush markers. I stamped the base of the card with the fishing lines image in brown ink. I added glitter pen to all of the lures, and glossy accents so all of the lures have a nice shine to them. The layers are all inked with brown hybrid ink. A new challenge is being shared today on the Impression Obsession Blog, and I hope you join the fun! This week’s challenge is Flowers for Friends. Pull out your Impression Obsession stamps and/or dies, and join us! The card I created uses Mother Goose (E19967) and Chickista (D19964). The ladies are stamped in black hybrid ink and colored with alcohol markers, with a bit of Stickles glitter glue for sparkle and shine. The background is stamped with Music Cover-a-Card (CC029). I pulled out an older stamp and die set to make the snowman for this card today. I love the simplicity of this snowman and his super cute face. I also like that the dies can be used to cut felt, so his scarf and hat are super fuzzy! Hats and scarves are necessary these days around here — brrrr! I colored the body of the snowman with colored pencils and Gamsol. I am not sure if the snowman stamp/die set are from Sizzix or Hero Arts... I’m leaning towards it being a Hero Arts set, since the back of the dies aren’t etched w/ Sizzix or a item number, which seems to be pretty standard for Sizzix. The heart dies I used are from Impression Obsession. The small hearts were made with Double Heart Edger (DIE132-D) and Heart Set (DIE135-E). 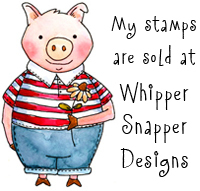 The “you make my heart happy” sentiment is from the Whipper Snapper Designs Everyday Sentiments cling mount set. I used one of the sentiments from the Whipper Snapper Designs All Things with Love cling mount set to stamp subtle grey text on the background, and across the body of the snowman for interest. We have a lot of days in our upcoming weather forecast that call for snow... still plenty of winter remains for snowman cards! Hope you’re keeping cozy! 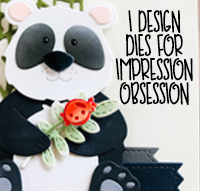 The Impression Obsession design team is featuring dies as the main focus for our inspiration projects today. I created a tag with the Sea Plants die set, and Shells die set. The seaweed is cut from green cardstock, and the shells were cut from white heavy-weight cardstock and inked with various pink, yellow, purple, and blue colors of Impression Obsession hybrid inks. I added some drops of Glossy Accents, adhered a few sequins, and brushed on some Wink of Stella glitter pen for a bit of sparkle. This tag was fun to make! I look forward to adding it to a gift for someone special. Pulled out one of my absolute favorite stamps to make a couple cards this evening. This gal is from Inky Antics, illustrated by Ronnie Walter. The image is stamped in black StazOn ink and painted with liquid dye inks. I added additional details to the images with colored pencil and Gamsol, and a Wink of Stella glitter pen. I also added some Glossy Accents to some areas of the colored image. The Life is Good sentiment is an old wood mounted stamp from A Muse Artstamps. Have you been using your older, favorite supplies lately? A new challenge is being shared today on the Impression Obsession Blog, and I hope you join the fun! 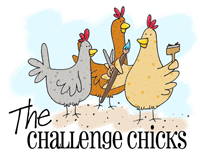 This week’s challenge is In the Pink! Pull out your Impression Obsession stamps and/or dies, and join us! The card I created uses Fancy Hat Bear (D15154). She’s stamped in black hybrid ink and colored with alcohol markers, with a bit of Stickles glitter glue for sparkle and shine. The background is stamped with Scribbled Checkerboard Cover-a-Card (CC199). I added some paper flowers, twine bow, and a sparkly gem stone to dress her up even more! The Impression Obsession design team is featuring dies as the main focus for our inspiration projects today. This scene card was created with the Patchwork Gator die, part of the Hello Summer die for the Hello sentiment, and the grass border die (Die060-I) to create a bit of greenery. He was fun to make, and would be super fun to create a bunch of them, using lots of different designer papers!